Rep. Steven Palazzo (left) learns about the new electromagnetic aircraft launch system aboard the aircraft carrier Gerald R. Ford (CVN 78) during a tour of Newport News Shipbuilding on Friday. 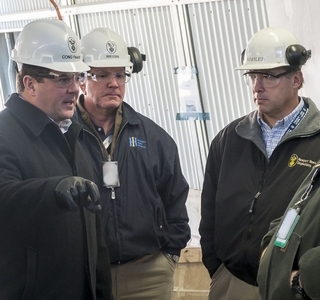 NEWPORT NEWS, Va. (Nov. 21, 2014) – Huntington Ingalls Industries (NYSE:HII) today hosted Rep. Steven Palazzo, R-Miss., for a tour of the company’s Newport News Shipbuilding division. Palazzo represents the fourth district of Mississippi, which includes Newport News’ sister shipyard, Ingalls Shipbuilding. 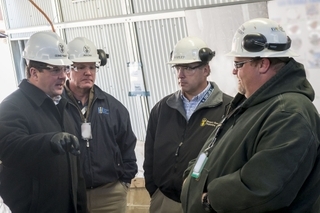 The visit provided an opportunity for Palazzo to see nuclear shipbuilding at Newport News and understand the value that Mississippi suppliers contribute to ship construction in Newport News. 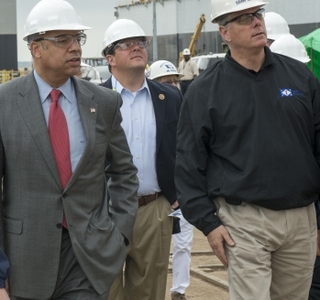 Palazzo’s visit included a tour of aircraft carrier Gerald R. Ford (CVN 78), which is about 85 percent complete and scheduled for delivery in 2016. 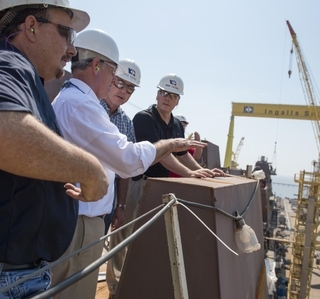 Shipbuilding suppliers in Mississippi contribute an average $3.6 million to Newport News’ efforts each year. Palazzo serves on the House Armed Services Committee and the Subcommittee on Seapower. He is also a chief deputy whip of the Republican Conference. 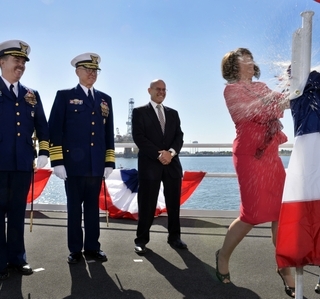 In addition to Ingalls Shipbuilding, Palazzo’s district includes Keesler Air Force Base, the Naval Construction Battalion Center (NCBC) in Gulfport and NASA’s John C. Stennis Space Center. The congressman was in the Hampton Roads area visiting NCBC sailors who are under quarantine following service in West Africa.